We’re demanding your Governor use the tens of millions of dollars your state is receiving from the VW settlement to upgrade their aging fleet of toxic diesel school buses to zero-emissions electric buses. This will clean the air in our communities, bolster the fight against climate change, and protect the lungs of the millions of kids who ride buses every day. 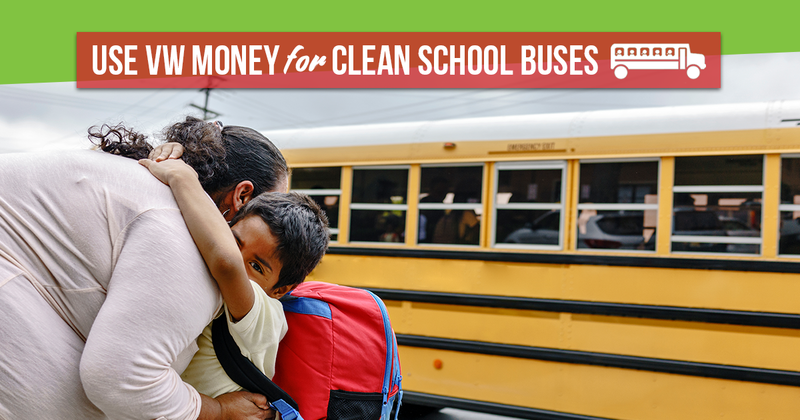 Tell your governor: Use the VW settlement money to switch from dirty diesel school buses to zero-emissions electric school buses! Fund zero-emissions electric school buses! We have a historic opportunity. After Volkswagen cheated federal emission tests, they are paying back the consumers and states they harmed with a $14.7 billion settlement. Our state is set to receive millions of dollars from the settlement and you need to put it to immediate use by transitioning to zero-emissions electric school buses and reducing toxic diesel pollution! This will protect the health of our kids who ride buses to and from school, as well as the air of the communities they drive through every day. Our kids shouldn't have to pay any price in order to receive an education. I urge you to use our state's VW Mitigation Trust Fund money to upgrade our aging diesel-powered school buses to zero-emissions electric buses, giving our kids the clean ride they deserve!